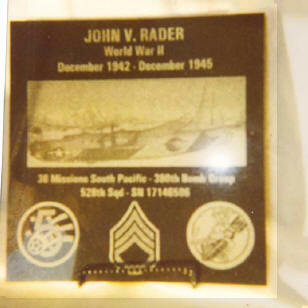 John V. Rader, 528th Squadron, has the following plaque in memory of his WWII service with the 380th. He wanted to share it with the other members. Bill Plassman, 530th Squadron, put together a B24J model of ON DEFENSE. He has been kind enough to send us photographs! Don and dad shared a tent and one day dad walked in to find Don reading a letter from his sister, she had also sent a picture of herself which was laying on the bed. Dad picked it up and asked Don who it was. Don told him it was his sister. Dad then said "I think I'll marry her." Don said "Like hell you will." Well, needless to say it did happen, mom and dad had been married 52 years when dad passed and had a daughter and three sons.